This is our Easter program, which we did the week leading up to Easter. I'm posting it a bit late, but we did have some fun! R decorated an Easter egg using wrappers from Easter eggs and glitter. I cut an oval from paper and R spread glue over the egg. He then collaged on the Easter egg wrappers and sprinkled glitter over it. R spent a long time at this activity. Using a paper plate and some cotton ball we made a paper plate bunny, seen at Tired Need Sleep. R transferred the pom-poms to the egg carton using tweezers. I created a sensory box filled with Easter items. R really enjoyed this and it was used so much over the week of this program. We used the items in the box to discuss hard and soft. I also hid items from the sensory box inside the hollow eggs for R to find. 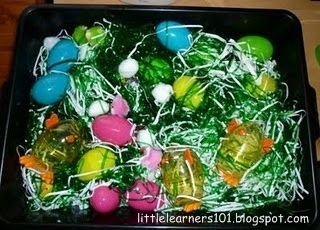 Our sensory box contained green and white cellophane 'grass', hollow eggs, solid chocolate Easter eggs (it took R a few days to realise that they were chocolates), some chicks - both soft and hard, cotton balls and 2 small rabbits. With our homemade playdough, R used an oval cutter to make eggs and decorated them with purchased playdough. I wish I had gotten a photo of this because the looked really good. I made a simpler bunny puzzle inspired by the Build A Bunny Game from Homeschool Creations. I printed 2 copies of a bunny picture I had on my computer, cut one up and kept the other whole. R matched the pieces to make a bunny. 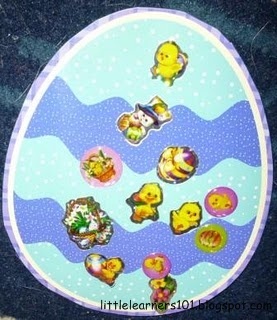 I also purchased some Easter themed stamps and R used these to create cards, with the addition of some Easter stickers. ﻿I can not remember where I saw this, but we put together our marble run and used solid chocolate eggs in the marble run. If you have this idea on your blog, please let me know and I will add in a link. R really enjoyed this. He loves the marble run and especially enjoyed eating a "treatie" when we were done. I made some Easter Egg Size Sorting Eggs. R needs a lot of help with this, and it created an opportunity to discuss big and small. We also used these in a mock Easter Egg Hunt. I hid them in our garden and R had to find them and place them in his hunting basket. I did this in preparation for our first annual Easter Egg Hunt on Easter Sunday Morning. I changed the words of "Little Peter Rabbit" to "Little Easter Rabbit" and we sung this with the aid of a home made rabbit finger puppet. R also hopped like a bunny. Using the hollow eggs, we had an egg and spoon race. I used a large kitchen spoon for R, so it was a bit easier for him to balance the egg. Together we made a batch of Hot Cross Buns in the breadmaker. It took up a whole morning by the time we mixed the dough, waited for them to rise, piped on the crosses and then baked them. We also made a batch of chocolate playdough. I used my regular playdough recipe and added in cocoa powder with the flour. It smelt delicious and I had to really watch R in the first few days because he wanted to eat it! We melting chocolate and spooned it into Easter Egg moulds. It got quite messy, but was a good opportunity to learn about solid to liquid to solid again. We read the story of Easter and also some books about the Easter Bunny. I made some Coloured Eggs in Microsoft Publisher and turned them into a matching game. To make it a bit harder for R is used 2 different shades of the same colour (light green and dark green). I made some cracked eggs for R to match up. I made the in Publisher using the oval tool and then made the 'crack' using the line tool. I cut them up and laminated them to make mini-puzzles. We used our hollow eggs and pom poms as a colour matching game. R had to match the coloured pom pom to the egg. As the eggs were new, they were quite hard for R to open so it also became a good activity for developing his fine motor strength. Next Program: Letter B and Blue.